Contains Clarinol CLA - Conjugated Linoleic Acid - the most effective formula available on the market! 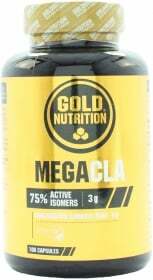 Have a question about Mega CLA? What is it, what does it do, how and when to use or something else? Ask us. Take 2 capsules at lunch time and 2 capsules at dinner time. WARNINGS Mega CLA : Do not exceed recommended dosage. Not recommended during pregnancy and lactation or in case of allergy to any of the components of the formula or other plants like saffron, chrysanthemums and daisies. Keep out of reach of children. Food supplements should not be used as a substitute for a varied and balanced diet and healthy lifestyle. Store in a cool, dry place. Please Recycle. BEST BEFORE: Please see lot number and expiration date stamped on the packaging.